"Carries the reader triumphantly from one climax to the next. Taut, tight, suspenseful. "—Steve Berry, New York Times bestselling author of THE CHARLEMAGNE PURSUIT and THE PARIS VENDETTA "SMASHER swings seamlessly from the cutthroat maneuverings of Silicon Valley to the equally competitive world of particle physics, and yet Raffel never forgets that this is a story about people. A smart, humane, compelling read. "—Marcus Sakey, award-winning author of THE BLADE ITSELF, AT THE CITY'S EDGE, and GOOD PEOPLE "Take a taut roller-coaster ride behind Silicon Valley's doors. Hold on and prepare to stay up all night. "—Cara Black, bestselling author of the Aimée Leduc series Smash and Grab As Accelenet CEO Ian Michaels battles a ruthless Silicon Valley billionaire for control of his company, his wife, deputy D.A. Rowena Goldberg, is targeted for death by an unknown assassin. Michaels must use his brains and business acumen to navigate a deadly trail of corporate and academic hostility, greed, and revenge as he races to find the assailant. Watch Keith's interview on Press: Here. 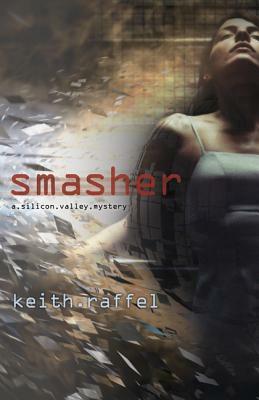 Keith Raffel is the author of Dot Dead and Smasher. As counsel to the Senate Intelligence Committee, Keith Raffel held a top secret clearance to watch over CIA activities. As a Silicon Valley entrepreneur, he founded UpShot Corporation, the award-winning Internet software company, and sold it to Siebel Systems. He has also been a carpenter, college writing instructor, candidate for elective office, and professional gambler. These days he stays busy writing his mysteries and thrillers in his hometown of Palo Alto, California where he lives with his wife and four children. Check the latest news at www.keithraffel.com. Click here to watch Keith Raffel discuss his book Dot Dead: A Silicon Valley Mystery as a part of the Authors@Google series. This event took place on July 24, 2007 at Google headquarters in Mountain View, CA. Watch Keith's interview on Press: Here.